Week 7 | Fox Walkers at Whatcom | SNOW DAY! Never Run From a Cougar! That Long-tailed Weasel is closing in and he looks hungry! while SkyeRabbit settles into a hiding place. This past Friday we woke up to an unexpected blanket of snow across Whatcom County. It had gotten very cold overnight and we had real snow! We put out a delay call to the parents to allow for roads to clear and met the Fox Walkers at Whatcom Falls in the later morning… Between the remaining fall colors, the snow and peaking of sunshine, the beauty was more staggering then normal… and the excitement from the children was palpable! I remember snow days as a child and the sheer joy of getting all bundled up to go play in the fresh snow until we were icicles then coming in for hot cocoa and going back out for round two! To help ease the comfort of the cold morning we took advantage of the nice little shelter to stay dry and made a nice hot fire to cook some popcorn over! While the kids played, I got a few batches of popcorn cooked, oiled and salted… During story we had a little popcorn and warn herbal tea party under the shelter while learning from Skye (as well as Moon Bird, Running Deer & their new friend “Mr Lovely” aka “Mr. Big Cat”) about how to stay safe when dealing with large creatures such as cougars or bears. While this may be a scary concept to some, storytelling is a great way to talk about hazards in a nonthreatening way so if we were ever to encounter these in real life we would have better understanding of what to do. In the case of both Bears and Cougars the main thing to remember is NEVER RUN! (For they both like to chase). Ask your child what they remember about how to react. If you were hiking with your family and encountered on of these creatures, what would you do? We made our way through this winter wonderland trailing the tracks of deer, squirrels and dogs… The snow is such an amazing canvas for animal tracking and can be an exciting intro into the tracking world for kids. While it was very cold, we noticed that the moving water such as the creek or the trout tanks and even the pond was not frozen over. This was interesting to process with the kids and we look forward to seeing the ice form as we creep closer to winter time. After navigating some tree tunnels and snowball fights I could feel the energy getting colder so I rallied the crew together for a big game of Subnivean Tunnel Tag! It is so much fun to play in the snow and even setting up the tunnels to play is so engaging! Everyone followed me like a giant flatfooted caterpillar as we slid around in a wild grid pattern making the grass appear as went over a few times … In Subnivean Tunnel Tag we start with one Long-tailed Weasel and a bunch of voles (or shrews or mice) … The voles can run through the tunnels trying to avoid being eaten (tagged) by the Weasel! If they get tagged they become a weasel… It is so much fun running and sliding and trying to stay in the tunnels… We could have played for much longer and everyone had nice warms bodies after this one. It was a natural time to transition to lunch. We had a picnic in the snow! When I asked the kids the last time they had done that, they were like "Hmmm... NEVER!” Such a great experience… We had such a great day and found some new spots to explore across the creek from our normal zones. 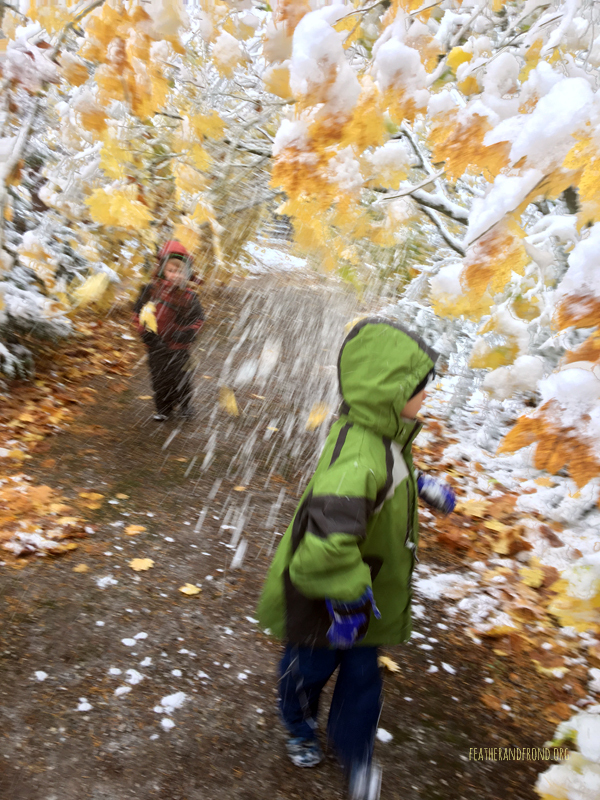 A few of them wanted me to “make the trees snow“ on them the whole way home — I did my best to oblige! I am so grateful for the days spent outdoors connecting to nature with children … and you cannot beat a good snow day!